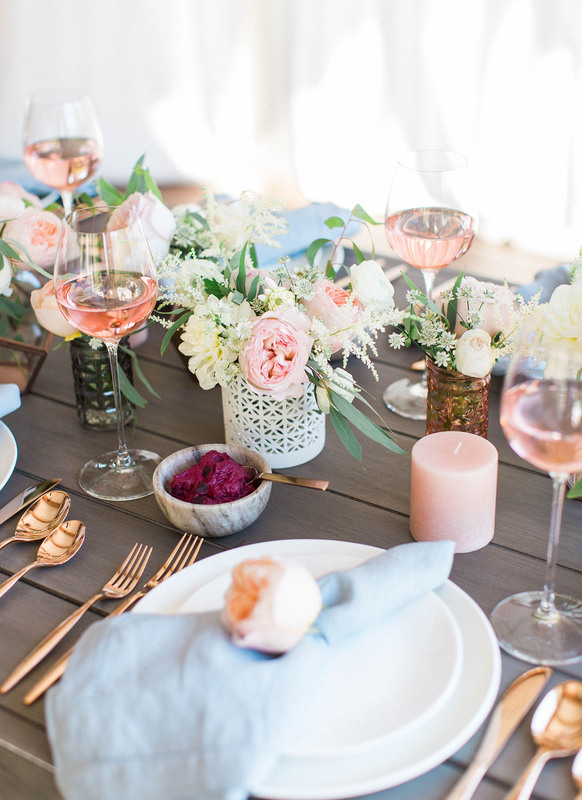 Summer is our favorite time of year, so we love using the season itself as an excuse to get our close friends together as often as possible – and our favorite way to do just that is with a backyard summer dinner party. For those of you who are intrigued, but may be intimidated or new to the whole ‘entertaining game’, trust us when we say that putting one together is a lot easier than you may think, especially when you have the right pieces right at your fingertips! 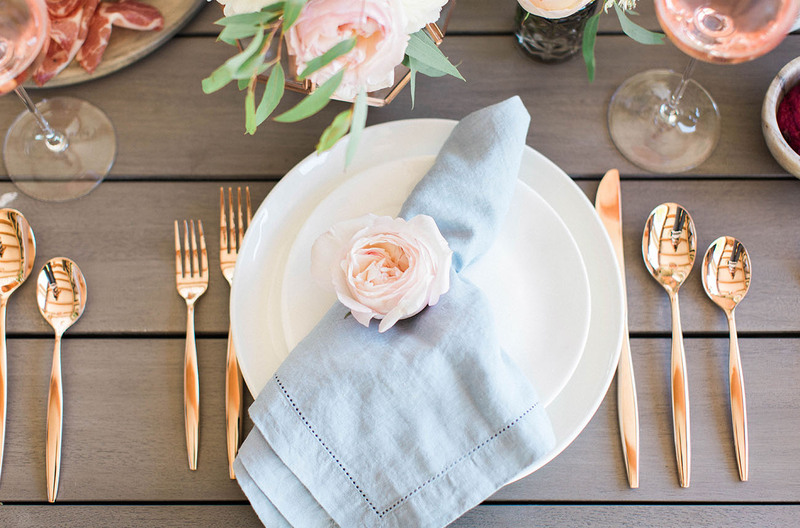 For this modern-rustic rosé dinner party, we partnered with Bed Bath & Beyond for most of our decor and tableware items. 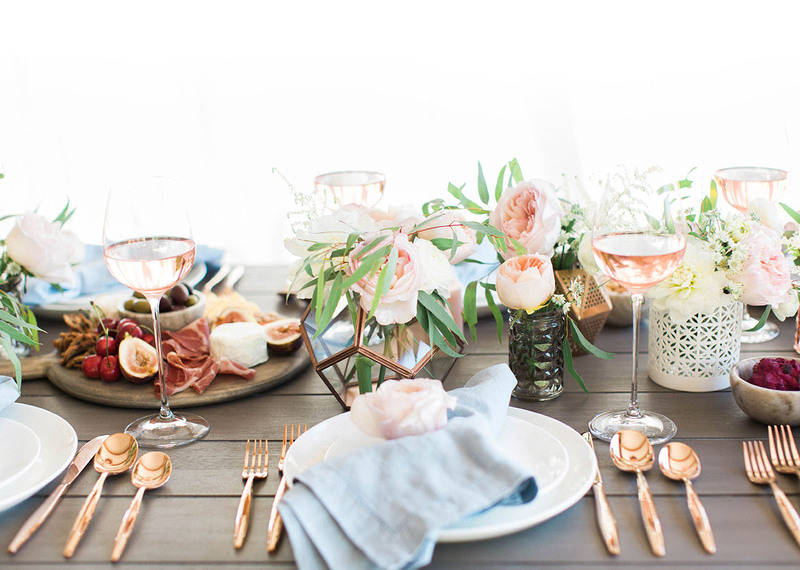 We LOVE their new collection, Olivia & Oliver, available exclusively at Bed Bath & Beyond, as it’s filled with elevated everyday pieces like their Organic Shape Dinnerware Collection, Madison Flatware in Rose Gold and Madison Stemware Collection. 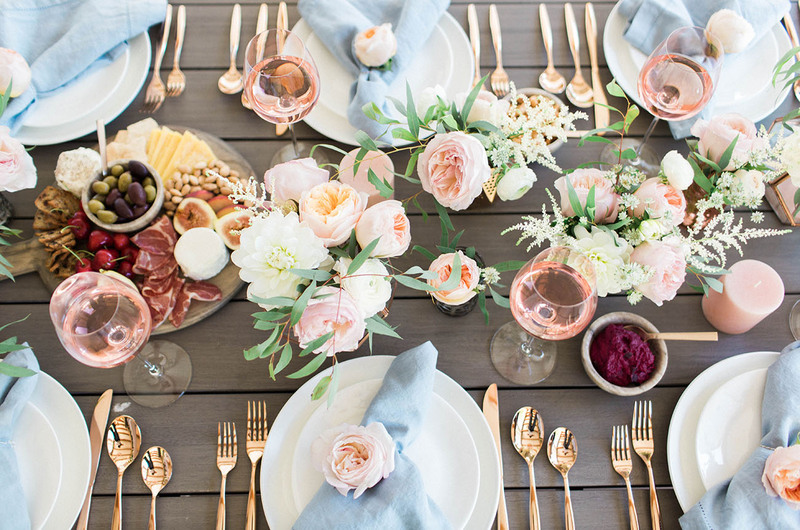 After getting the chance to use the items firsthand, we can definitely say that the Olivia & Oliver collection is perfect to add to your wedding registry! You’ll get tons of milage out of each and every peice and they’ll look great styled for tons of different occasions + holidays. 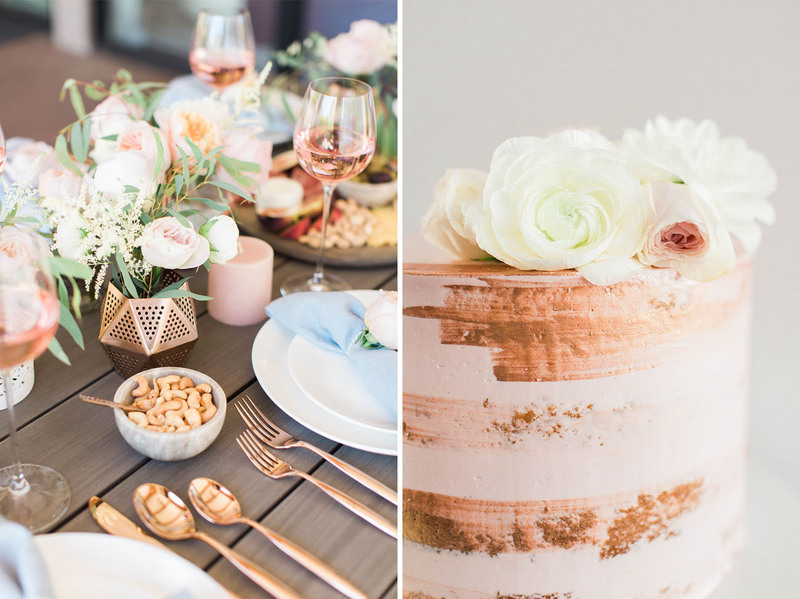 We always think the best way to get the full registry experience is to visit a store and meet with an experienced registry consultant to touch + feel products in person, and we don’t think you’ll be disappointed when you see this pretty collection for yourself. 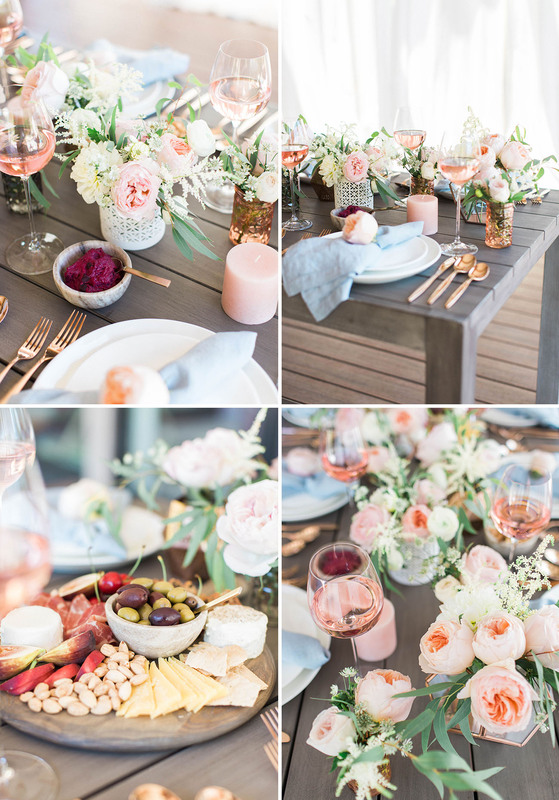 Below, we’re sharing a few key tips for recreating our modern-rustic rosé dinner party – and details about what was on our menu and what Bed Bath & Beyond items we incorporated! Looks so good, right?!! 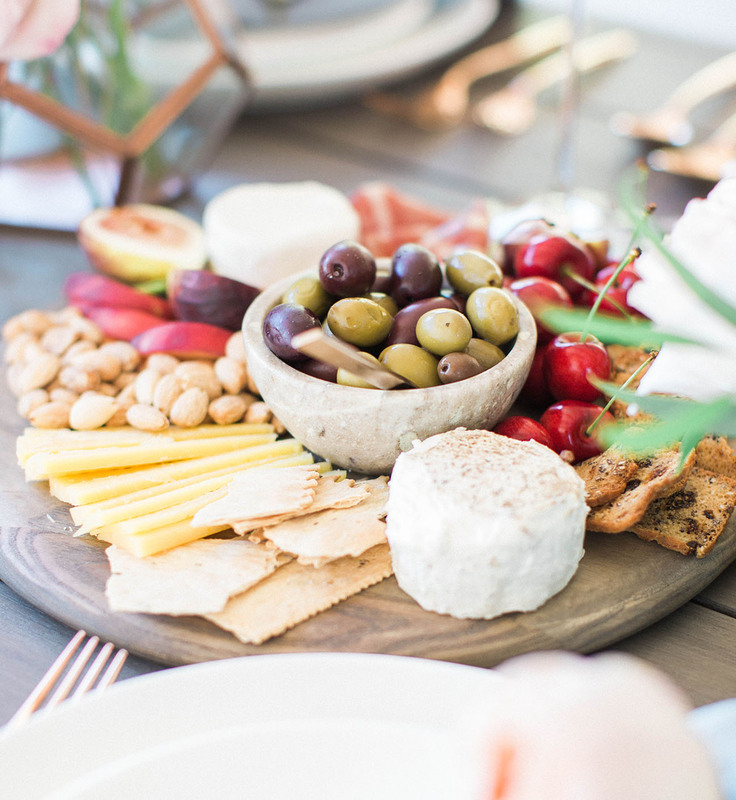 When you have the right pieces for a cheeseboard, they couldn’t be simpler to throw together and, it probably goes without saying, everyone loves them! 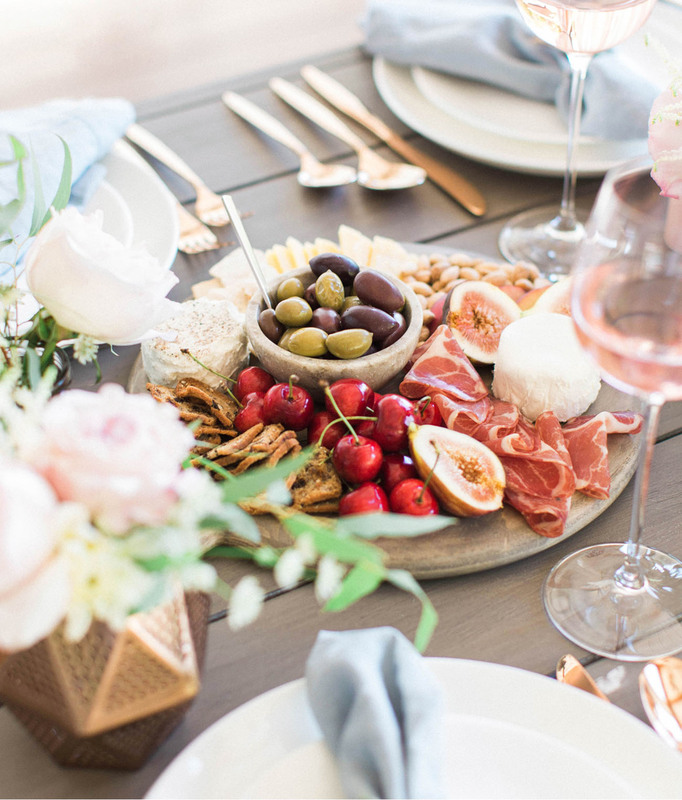 We just grabbed our ingredients at Trader Joes and Whole Foods and arranged them on a rustic, round wooden board. 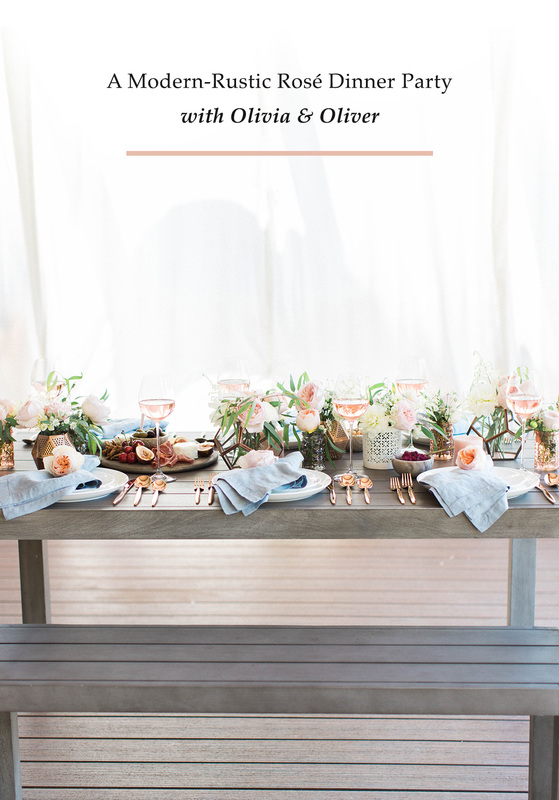 We also put together some easy floral arrangements that would be a cinch to recreate with a few small metallic vessels and finds from the grocery store or flower market. 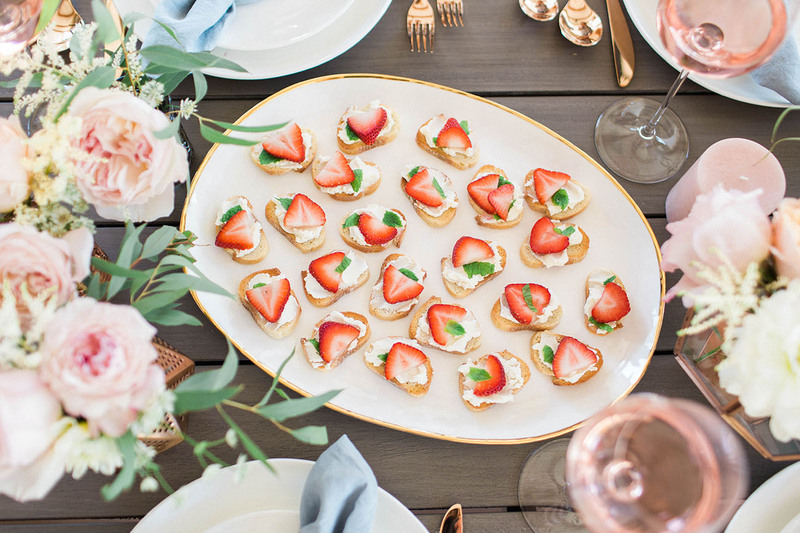 Another super easy snack to throw together are yummy crostinis – like these made from toasted bread, honey goat cheese, sliced strawberries and mint. The best way to make them look even better than they taste is with the right platter or vessel and, for that, we love this Harper Organic Gold-Rimmed Platter! 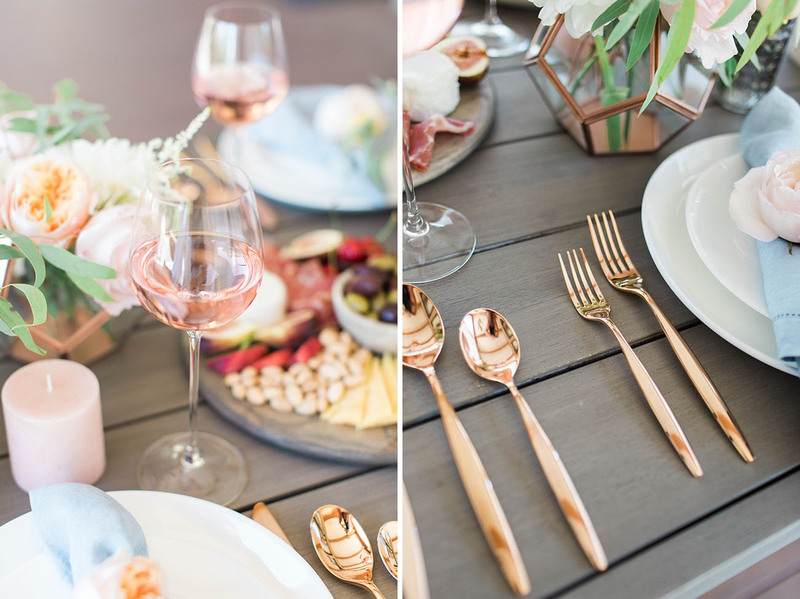 Seriously OBSESSED with this Madison Flatware in Rose Gold (and it also comes in gold, silver and black matte)! 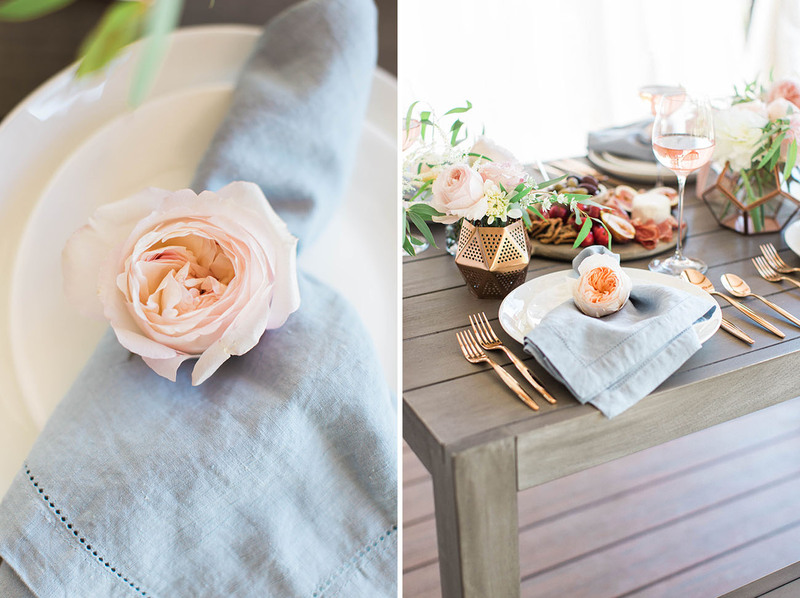 We paired it with our favorite linen napkins. 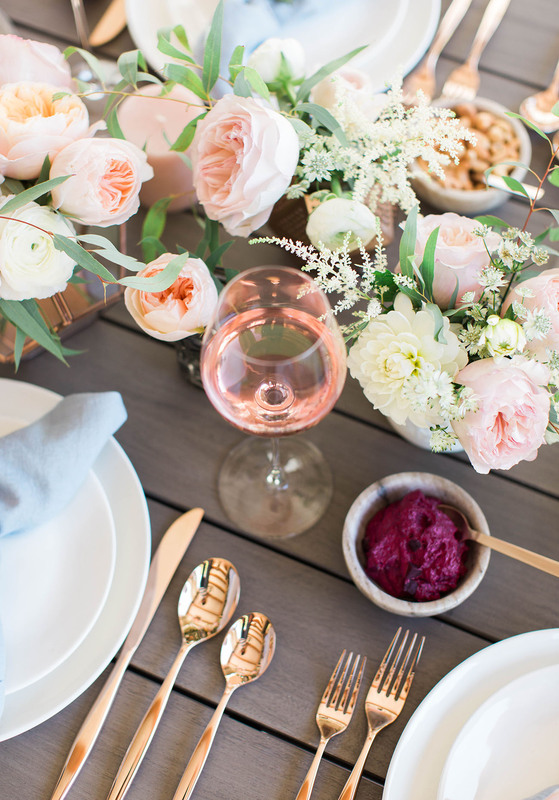 For drinks, rosé is always the perfect choice for summer, and we found that Olivia & Oliver‘s wine glasses were both elegant + durable, making them perfect for the backyard. 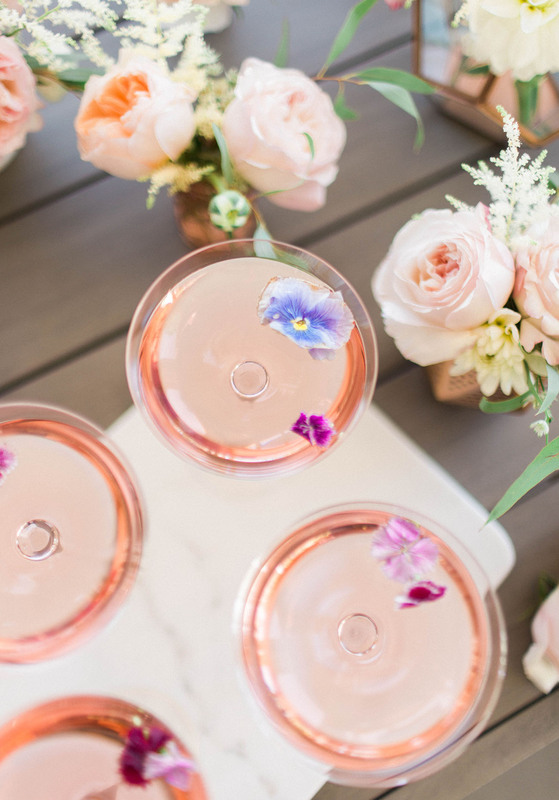 We also created a simple cocktail with O&O’s gorgeous cocktail glasses using rosé, grapefruit juice and gin with an edible flower on top! 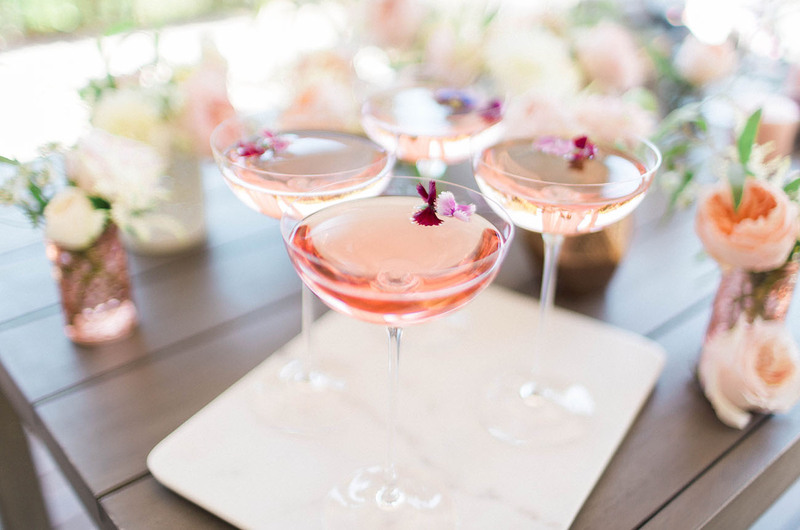 The cocktails sat pretty atop a Marble Server, and, tip from our team, you can typically find edible flowers at your local Whole Foods or higher end grocery store. And, of course, no party is ever complete without dessert! 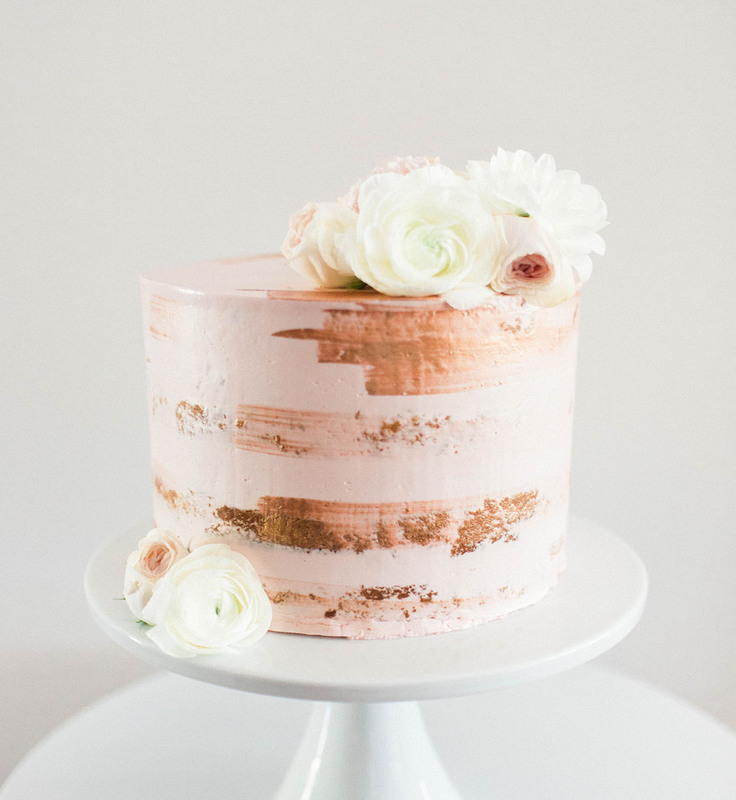 We were swooning over this semi-naked rose gold + pink cake by Sheila Mae. 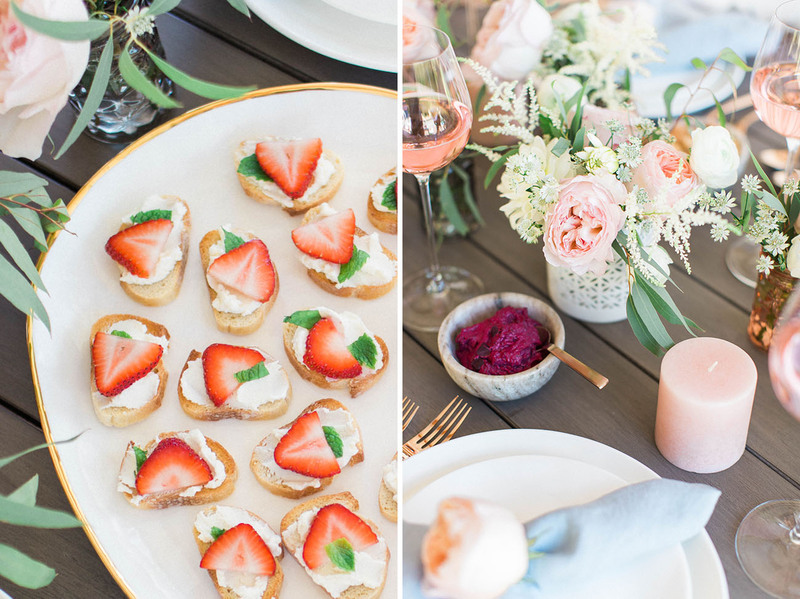 So perfect for ending our modern-rustic rosé dinner party on the sweetest note! 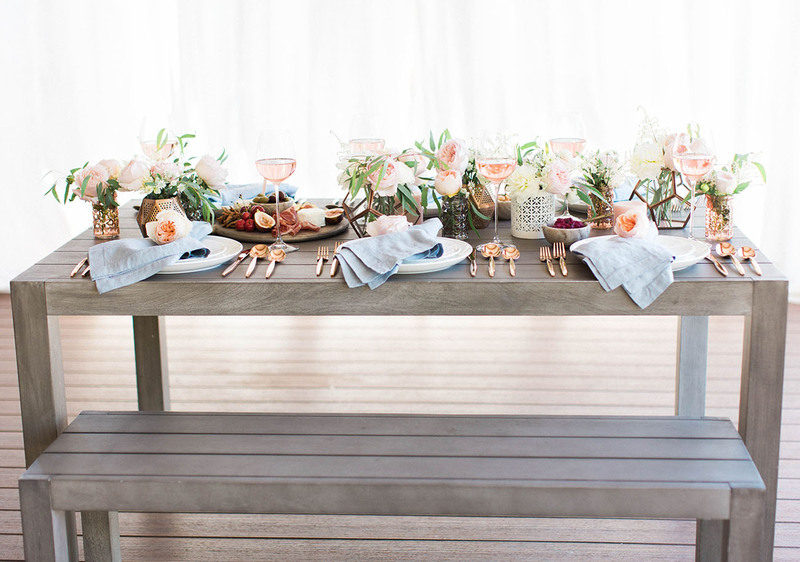 We hope you are inspired to put together your own backyard dinner party before summer comes to an end! 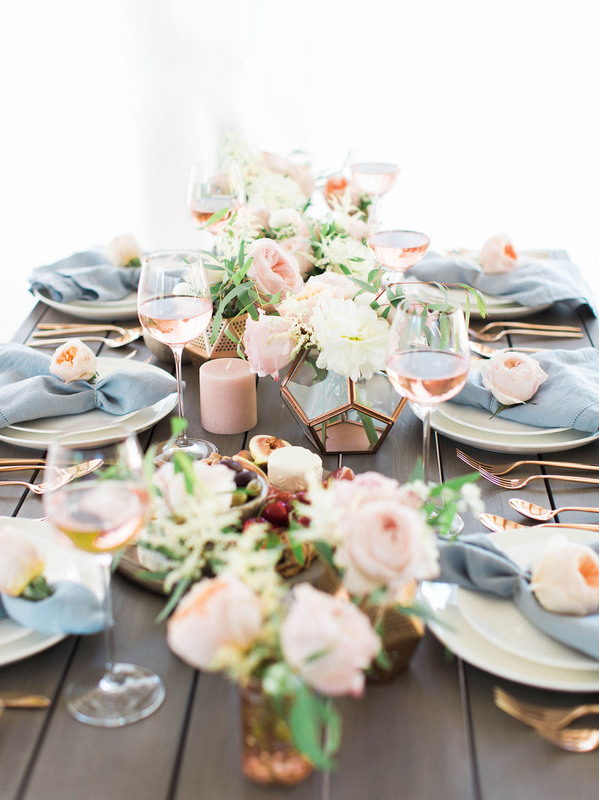 And for those of you currently working on your wedding registry, who loved the vibe of our rosé soiree, be sure to check out the new collection from Olivia & Oliver, available exclusively at Bed Bath & Beyond! * This post is sponsored by Bed Bath & Beyond. All content, ideas, and words are by Green Wedding Shoes. Thanks for supporting our sponsors! Ahhh this is so heavenly! Rose all the way!